These antique silver lead-free pewter charms come in a set with one charm for each of the twelve days of Christmas. Perfect for charm bracelets and wine glass charms. These antique gold lead-free pewter charms come in a set with one charm for each of the twelve days of Christmas. Perfect for charm bracelets and wine glass charms. Karen Silver is truly original, unique and hand-made, and this woven flower is no exception. This gorgeous woven flower pendant is made from 99.9% fine silver. It is 35mm x 35mm. Karen Silver is truly original, unique and hand-made. This delightful "day song" pendant is made from 99.9% fine silver. It is 24mm x 25mm. Ahoy there! Delightful little metal sword pendants. Ideal for jewellery. These would also make great embellishments for cards or scrapbooking pages. Each sword is approx. 32mm x 26mm. Lovely silver metal cross pendants. Each cross is approx. 32mm x 26mm. Gorgeous silver thong charm, with pink enamel and diamontes. The thong is approx. 24mm x 12mm. 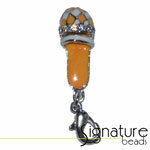 Gorgeous silver thong charm, with orange enamel and diamontes. The thong is approx. 19mm x 8mm, and approx. 32mm including the parrot clasp. Gorgeous silver thong charm, with orange enamel and diamontes. The thong is approx. 18mm x 8mm, and approx. 30mm including the parrot clasp.